I was turned onto a new site the other night at the PMQG meeting… it’s called Threadbias ~ and it’s AWESOME!! Another PMQG member is a part of the team that put it all together and she did a small presentation on it at the last meeting, so I came home and made an account. Check it out here! It is full of great tools, I especially like being able to put swatches of fabric onto a virtual “design wall” to see how certain fabric patterns look together. This is great, especially if you’re like me and can’t afford to create a big fabric stash to work with. I also like that I can post my progress on my sewing projects, and the people that are seeing my posts are ALL interested in sewing… I’ve already gotten comments on my posts there! Anyway… just wanted to give a shout out to Amanda and say: great job on the site!! That’s all for now folks!! 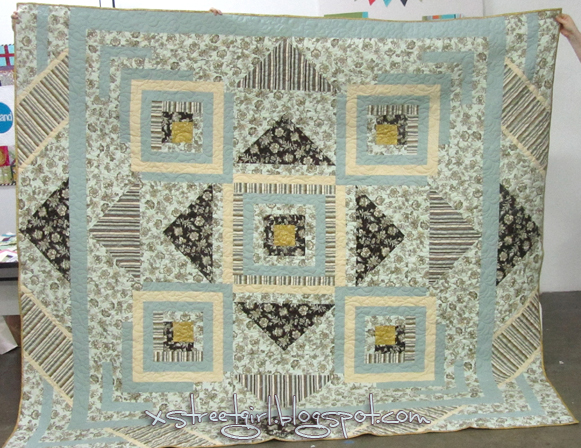 Beautiful quilt for your in-laws! I am sure they were THRILLED! !